Letters are the subject of this week’s photo challenge. I’m always taking photos of signs, graffiti and directions that interest me when I’m travelling. However, I thought that for this challenge I would stay right here in Wales. The Wales Millennium Centre is one of the most iconic buildings in Cardiff. 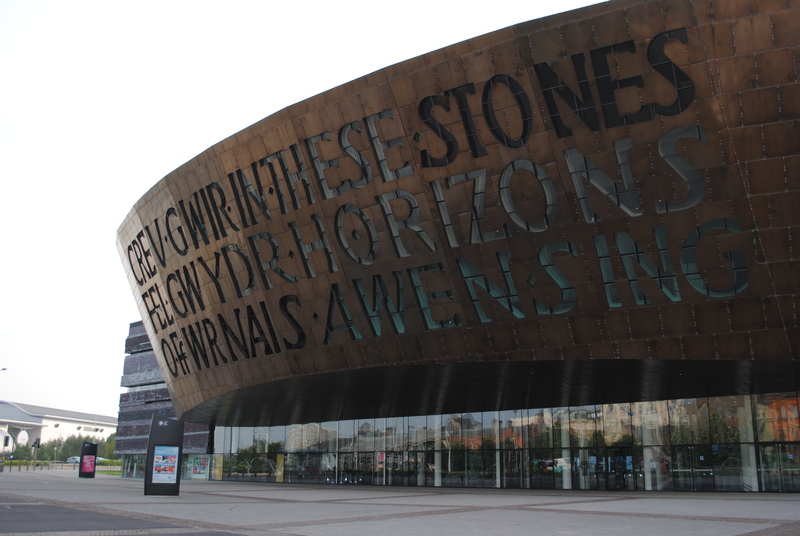 Built from all Welsh wood, slate, steel and glass, the centre was designed as part of the Cardiff Bay regeneration project. It took over 20 years for the idea for a Welsh home for the arts to be realised. The English inscription reads ‘In these stones horizons sing’. Just as poetic, the Welsh inscription says ‘Creu Gwir Fel Gwydr o Ffwrnais Awen’, which translates into English as ‘Creating truth like glass from the furnace of inspiration’. The letter themselves are actually windows into the building, making it a bright and sociable place that is loved by both visitors and residents. If you go into the 1st floor bar, you can sit in the letters and look out over Mermaid Quay. Click here to see other entries for this week’s challenge. “Creating truth like glass from the furnace of inspiration” – love this! Those are huge letters in a unique building.